RISMEDIA, December 20, 2010—As the decorations go up and the temperatures go down, winter is the perfect time to cozy up and indulge in a holiday movie marathon. While the Whos in Whoville and elves in Santa’s workshop live happily in our imagination, there is a plethora of real-life locations where some of the best holiday movie moments were captured. Here are some favorite festive flicks from over the years and a sneak peek at the homes and spaces that were part of the Christmas-season movie magic. A movie loved by families worldwide, the story of 6-year-old Susan and Kris Kringle in “A Miracle on 34th Street” is the ultimate Christmas classic, and has been for over 50 years. The original was filmed in 1947 and starred Natalie Wood, Maureen O’Hara and John Payne. Since then, there have been four remakes of the movie, the most recent being a 1994 feature film starring Mara Wilson and Dylan McDermott. A majority of the movie is centered around Macy’s flagship store on 34th Street in New York City where Mr. Kringle is hired as Santa. One of the most memorable scenes, however, is when little Susan’s Christmas wish comes true and she sees the house of her dreams for the first time. The real home used as Susan’s dream home is located in Port Washington, New York. The 1,703-square-foot home still stands to this day and looks practically the same as it did in 1947. A holiday season rarely passes without hearing the infamous phrase, “You’ll shoot your eye out!” This, of course, pertains to the Red Ryder BB-gun idolized by Ralphie Parker, but also serves as one of the most memorable lines of the Christmas classic, “A Christmas Story.” Filmed in 1983 and set in the 1940s, “A Christmas Story” has maintained its popularity over the years and has become a top-of-mind flick during the holidays. As a tribute to its immortality, the house originally used in the movie was completely restored and is now open to visitors who wish to walk in little Ralphie’s shoes. Located in Cleveland, Ohio, “A Christmas Story House” is open for tours year-round and sits right across the street from a museum of movie moments, props and costumes. Inspired by “A Christmas Carol,” this comedy, “Scrooged,” stars Bill Murray as a selfishly cynical television executive who bathes in wealth but is horribly cold-hearted to his employees and family. As in the Charles Dickens’ original, Murray’s character, Francis “Frank” Xavier Cross, is haunted by three spirits on Christmas Eve who are determined to help him appreciate the spirit of Christmas. Before he embarks on his lesson-bearing adventure, we see Mr. Cross in his executive element, peering down at a recently fired employee from his towering office in New York City. It just so happens that the office building used in the movie is the 38-story, Midtown Manhattan skyscraper known as the Seagram Building. According to the movie location website On the set of New York, the corporate tower stands 516 feet tall and was built in 1958 as the headquarters for Canadian distillers Joseph E. Seagram’s & Sons. The booby-trapping antics of Macaulay Culkin in his claim-to-fame flick, “Home Alone,” are always a family favorite come holiday season. And, aside from the sneaky robbers (aka Wet Bandits), Culkin’s character, Kevin McCallister, shared most of his screen time with the picturesque house that the rambunctious McCallister family called home. Today, the “Home Alone” house that Culkin so creatively defended sits quietly on a tree-lined street in Winnetka, Illinois, and is free and clear of rigged blow torches, flying paint cans and loose tarantulas. According to Zillow, the home was built in 1920 and features five bedrooms, 3.5 bathrooms and 4,243 square feet of living space. Culkin comes back for an encore performance as Kevin McCallister in “Home Alone 2: Lost in New York.” While the sequel sprouts the same premise of a frantic McCallister family who loses Kevin en route to a Christmas vacation, Kevin is set to defend a different location this time around—a monstrous toy store known as Duncan’s Toy Chest. Despite the film’s title, a little bit of digging revealed that Duncan’s Toy Chest was filmed at The Rookery, which is far from a department store and far from New York. The building used is actually a condo property on La Salle Street in Chicago, Illinois. In “Elf,” Will Ferrell takes us on a hilariously heartfelt adventure as Buddy—a human raised by Santa’s elves who travels to New York City in search of his true identity. Since the 2003 film takes place in the Big Apple, most of the movie’s locations are veterans of the big screen, (i.e., the ice rink at Rockefeller Center, the Empire State Building and Central Park). As it turns out, the building where Buddy’s father lives is a blockbuster veteran as well. Nicknamed the “Ghostbuster Building,” the building at 55 Central Park West served as the location to several scenes in 1984’s “Ghostbusters” movie and, more recently, the home of Buddy’s cynical, naughty-listed father, Walter Cobbs (James Caan). Built in 1929, 55 Central Park West opened with apartments ranging from three to nine rooms and set itself apart from neighboring Upper West Side buildings with a unique art deco exterior. Over the years, the co-op property has been home to several famous residents, including Calvin Klein, Donna Karan and Noel Ashman. For Billy Bob Thornton fans, “Bad Santa” is a Christmas favorite. Thornton puts a spin on the Grinch character by playing a mall Santa who cons his way into employment and robs different malls after hours. Thornton eventually befriends a troubled kid and takes up residence in his house while the parents are out of town. It was a pleasant surprise to discover the stucco-style home featured in the film is actually up for sale. The five-bedroom, 4.5-bathroom estate is currently on the market with an asking price of $1 million. Despite the home’s silver screen appearance, it boasts several other assets that are sure to attract the right buyers. According to the listing, the West Hills, California, house features panoramic city views, a custom infinity pool, barbeque center and 4,100 square feet of living space. While the movie received mixed reviews, the star-packed, romantic comedy, “The Family Stone,” was set in a gorgeous house in Riverside, Connecticut. 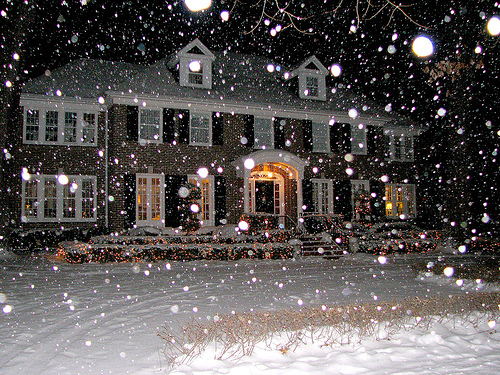 In the movie, the 1860 colonial is the home and place of gathering for the Stone family’s annual Christmas celebration. Likewise, it is the place where a new and rather tightly wound girlfriend (Sarah Jessica Parker) is meeting the close-knit family for the first time. The 3,554 square-foot house consists of 10 rooms—five of which are bedrooms—3.5 bathrooms, and sits on 1.4 acres. With a classic, yet cluttered interior, this house is the ultimate, well-worn home that every family dreams of filling with holiday memories. In the romantic comedy, “The Holiday,” two guy-troubled women (Kate Winslet and Cameron Diaz) swap homes for the holiday season. True to romantic comedy form, both women find new loves at their new addresses. The home that Diaz swaps into is a quaint cottage on the English countryside. The swanky abode that Winslet temporarily takes over, however, is a Wallace Neff-designed home located in the small, affluent city of San Marino, California. According to Zillow, the 10,324-square-foot mansion has nine bedrooms, five bathrooms and a large outdoor pool (also featured in the film). Public records show the home last sold for $3,250,000 in 1998. Lauren Riefflin is PR/Marketing Coordinator at Zillow.com. Next postGoing Green without Breaking the Bank!